Hurricane Joaquin, now a category four storm packing winds of 130 m.p.h., will eventually make an easterly turn out to sea before it has the chance to strike the United States, the National Hurricane Center is predicting. 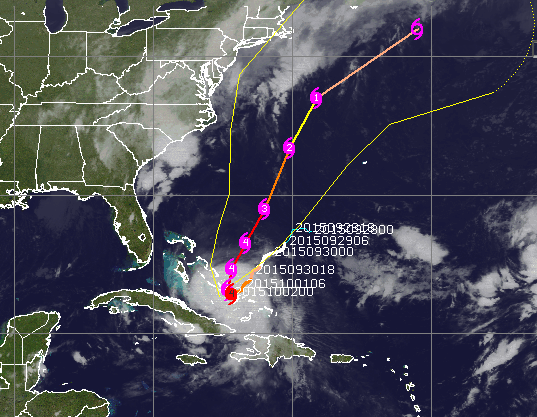 Updates released early Friday morning showed Joaquin making the turn Sunday night about halfway between the Carolinas and Bermuda, the continuing to swing northeast toward the Canadian maritimes by Tuesday. Earlier in the week, the hurricane center’s official forecast showed the storm threatening the New Jersey coast, leading to preparations up and down the shoreline. “The forecast models continue to indicate a track farther away from the United States east coast and the threat of direct impacts from Joaquin in the Carolinas and mid-Atlantic states appears to be decreasing,” the hurricane center said in an update package posted late Thursday night. Despite the path, forecasters still warned some effects would be able to be felt by coastal residents in New Jersey and elsewhere. Joaquin’s potential affects are separate from the nor’easter that is currently bringing tidal flooding and rough surf to the Shore area.